As a former paramedic, I know that saying “reliable communications are essential” is truly an understatement. It can be all the difference in patient care. After more than 30 years in the EMS field, I joined FirstNet because I know it will revolutionize the way EMTs and paramedics serve their communities. 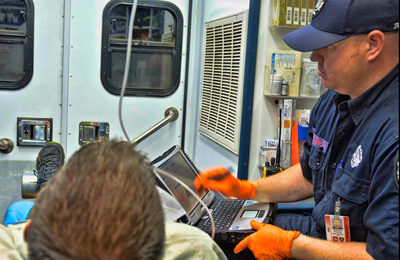 With FirstNet, EMS practitioners can communicate effectively and efficiently, whether they are treating patients at a scene or en route to the hospital. The network’s “always-on” connection links EMS professionals and hospitals by providing public safety with asset tracking and location services, push-to-talk priority and preemption, secure data sharing, and 24/7 customer support. EMS using FirstNet are already seeing its possibilities and learning how the dedicated communication system dramatically supports their work in the field. For example, during the 2018 Volvo Ocean Race in Newport, RI – an event where tens of thousands of tourists used their phones to send pictures and receive updates on races – the Rhode Island Emergency Management Agency (RIEMA) stayed in constant communication with field personnel and maintained better situational awareness using FirstNet. FirstNet helped support EMS when an individual fell overboard during a mock-up boat race. During this situation, the FirstNet network enabled public safety with location-based technology so that the dispatch team could identify the closest deployable unit and allowed the Disaster Medical Assistance Team (DMAT) to transmit critical, sensitive information to field hospital staff ahead of the patient’s arrival. The Metropolitan Emergency Medical Services (MEMS) team in Little Rock, AR, also transitioned to FirstNet to fulfill their communication needs. According to Executive Director John Swanson, “it was an easy transition for us and in a sense, a no-brainer, because it was another enhancement and another layer of redundancy that allows us that capability to be sure we can communicate when things are at their toughest.” FirstNet allows MEMS to effectively respond to 911 calls with pre-arrival instructions and locate and dispatch over 50 ambulances and support vehicles across city boundaries. The First Responder Network Authority and our partner, AT&T, will head to Nashville for the annual EMS World Expo Oct. 29 – Nov 2. I hope you’ll join me at my breakout session at 9:15 a.m. on Nov. 2, “FirstNet Possibilities: Dedicated Public Safety Mobile Broadband Communications is Here for EMS.” I’ll share more about how FirstNet can benefit patient care and enable fluid, parallel communications between EMS personnel and hospitals. I’ll also share the history of the nation’s first dedicated system for first responders, elaborate on our contract with AT&T, and define the basics of broadband communications in relation to LMR voice-only systems. You can also find me at the First Responder Network Authority booth #1812 to answer questions and hear about your experience with emerging technologies in the field. We’ll also be at the Affiliate Advisory Council Meeting and Luncheon to meet with state-level affiliates of the National Association of Emergency Medical Technicians (NAEMT) and discuss our role in improving patient outcomes. Chad Tucker, FirstNet Solutions Consultant Manager at AT&T, will be with me to discuss the FirstNet partnership. For a full list of events at EMS World Expo, visit: https://www.emsworldexpo.com/agenda. Learn more about FirstNet for EMS at https://www.firstnet.gov/resources/firstnet-and-emergency-medical-services or view our EMS factsheet. Sign up for my regular EMS update, and follow @FirstNetGov on Twitter.